Adding fruits and veggies to breads adds a lot to the taste and increases its nutritive value too. Sweet potatoes are in season and market is full of them. Sweet potatoes make a wonderful addition to breads. Its natural sweetness enhances the taste. It makes the breads a bit dense but adds natural sweetness and also loads of nutrients. 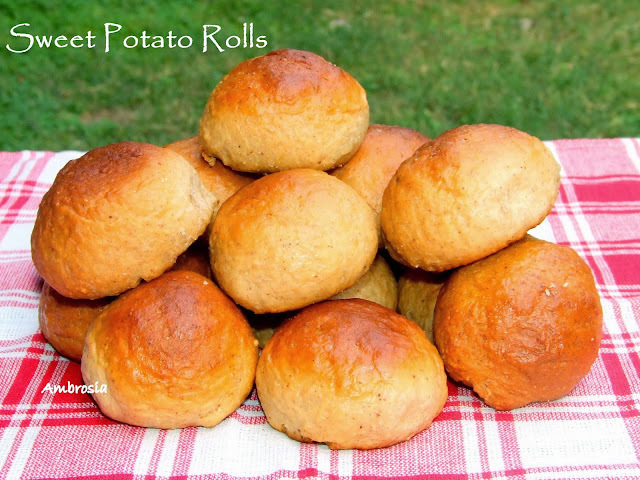 I made sweet potato rolls yesterday. The warmth of spices and sweetness of sweet potatoes make them just the right choice for breakfast or a good accompaniment to the afternoon tea. Enjoy them with a generous drizzle of honey, or slather some butter and enjoy with hot tea. Mash sweet potatoes. Add sugar and milk to make a paste. Whisk together 2 cups all purpose flour, salt cinnamon powder, nutmeg powder and yeast. Add this is sweet potato paste. Mix well. Add more flour from the remaining one cup flour and knead. Keep adding flour till you get manageable dough. Knead till soft and supple. Transfer dough to an oiled bowl. Turn the dough to coat it with oil from all sides. Cover and let it rise for 1 hour. 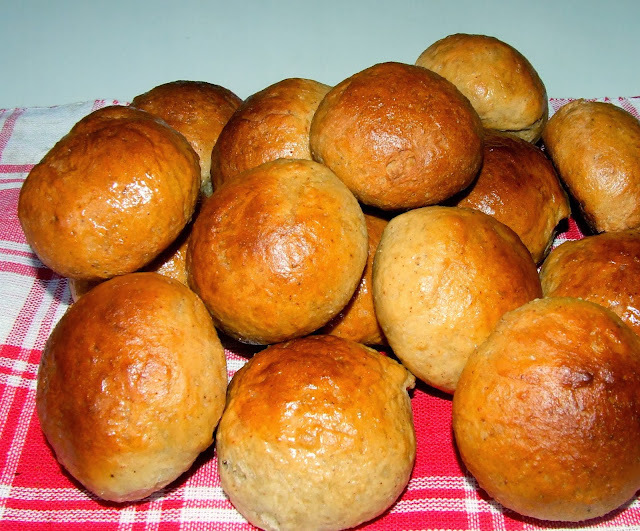 Punch the dough, divide into 16 to 18 pieces, and shape into rolls. Place them in a greased baking tray. Cover and allow them to rise for 1 hour or till double in size. Bake in a preheated oven at 190 degrees C for 20 to 25 minutes or till well browned. Remove from the oven, place on the rack to cool. Brush the top of the hot rolls with some butter. I have missed on a whole lot of lovely posts and am trying to catch up with each of them now. These rolls look amazing and to know the healthy ingredient in it doubles the joy. You make them sound so simple. So beautiful I won't want to eat them!! Hello, I m making these as potato rolls. Substitutions- 3 cup whole wheat flour, 1 cup mashed potatoes, 1/4 cup white sugar.Kept them for proofing. Forgot to update you, they did come out well! !